Two senior government officials deny U.S. involvement in North Korean Internet outage. 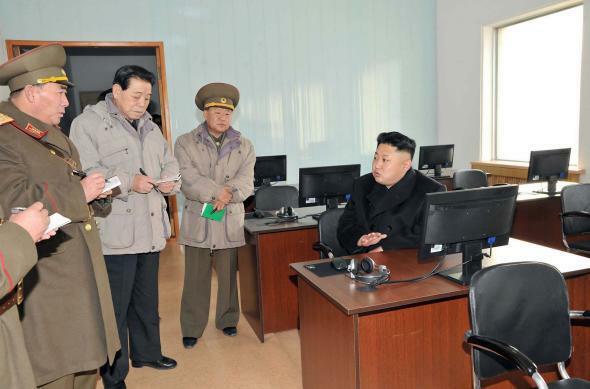 Kim Jong-un inspects the Korean People’s Army command center. Two senior U.S. officials told the Associated Press that the United States did not launch a hack against North Korea to take down its Internet last month. The U.S. government was suspected because reports that North Korea’s Internet was down started on Dec. 20, hours after President Obama said that the U.S. would “respond proportionally” to North Korea for perpetrating the Sony Pictures hack. Ever since the incident, it has been unclear whether the situation was caused by an infrastructure problem, a hack that came from the U.S., or an attack launched by someone else. The Obama administration was quiet, and the AP reports that there was even uncertainty within the White House about what had actually happened. But two anonymous senior officials have now told the AP that the U.S. government was not behind the outage. The Obama administration was reportedly reluctant to discuss the situation because it wants to avoid disclosing details about the U.S.’s cyber-offensive capabilities. It also may be trying to confuse the North Koreans.